The second phase of the Upazila Parishad election is underway. The elections is being held in 116 upazilas in 16 districts at 7,039 polling stations. The voting began at 8am and will continue till 4pm without any break. 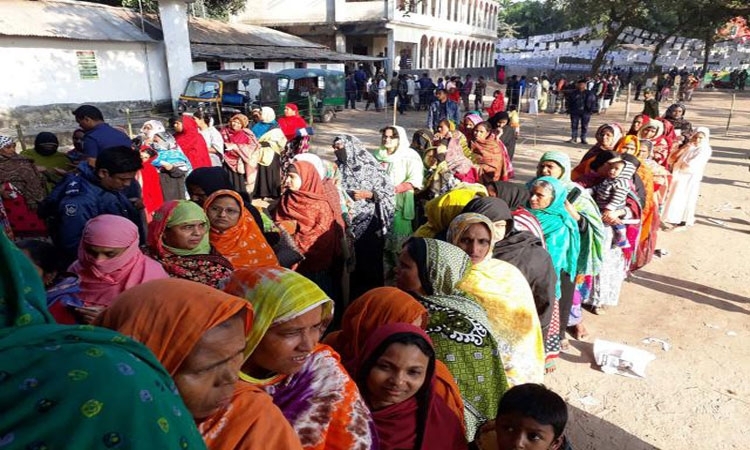 Some 377 chairman, 548 vice-chairman and 400 woman vice-chairman candidates are contesting the election in the 116 upazilas where there are some 17,909,006 voters under 7,039 polling stations in 116 upazilas of 16 districts including Thakurgaon, Rangpur, Gaibandha, Dinajpur, Bogura, Naogaon, Pabna, Sylhet, Moulvibazar, Gopalganj, Faridpur, Chattogram, Rangamati, Khagrachhari, Bandarban and Cox’s Bazar. Besides, 23 chairman, 13 vice-chairman and 12 woman vice-chairman contestants have already been elected uncontested in the absence of any valid candidate to oppose them. A large number of security members, including police, Rab, BGB and Coast Guard, have been deployed in the election areas since Saturday. They are slated to remain so till Wednesday. Besides, a judicial magistrate was deployed in each upazila and an executive magistrate for every three union parishads for the five days to punish any violations of the polls code. A security team comprising of 14-16 members drawn from police, Ansar and VDP will guard each polling station on the day. The Public Administration announced a public holiday in the 116 upazilas for Monday. The first phase of the election was held on March 10. The third phase election is scheduled to be held on March 24 and the fourth phase on March 31. The first upazila election was held in 1985, while the following three were held in 1990, 2009 and 2014. The 4th upazila election was arranged in six phases after the 10th parliamentary elections were held in January 2014.